Zoom! is the best investment you can make in yourself. 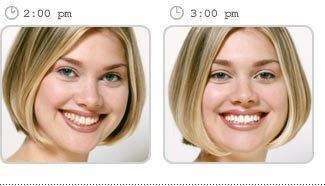 Our revolutionary technology is clinically proven to get your teeth their whitest. Over 800,000 happy clients worldwide agree! 1. Zoom! whitening gel is carefully applied to your teeth. 2. The gel is then activated by Zoom's patented gentle blue light for 20 minutes while you relax and watch TV or listen to music.